Deciding where to study tourism can be a difficult decision for any international student. The United States is one of the top tourism destinations in the world, an important factor to consider when choosing a study location and a degree in the field. The first thing to consider when deciding where to study tourism is what you want to specialize in, along with the type of degree you want to pursue. Are you interested in obtaining an undergraduate degree or are you ready to earn a graduate degree? Some schools may also offer joint degree programs such as a dual degree in business administration and tourism management. Dual degrees can be very beneficial to students because they involve gaining a broad-range of knowledge in different fields which can be very useful in this industry. Once you have chosen your concentration and degree, you will want to see if these schools also offer internship and partner program placement (a partner program gives students the opportunity to participate in an internship as part of the curriculum). This experience could prove invaluable as students gain important industry knowledge that will make them competitive in the job market upon graduation. Some international students may also find long-term employment if they show interest and willingness to work hard. Depending on the company, international students could find themselves working around the world in a truly international capacity. Once you've narrowed down your option based on academics, the next consideration is the location of the college or university. Students should choose a place where they can observe the tourism industry first-hand. University of Hawaii at Manoa, for example, offers a degree in travel industry management and is located in one of Hawaii's biggest tourist destinations. The city of Manoa is only three miles from downtown Honolulu and less than a mile from Waikiki. The university was also named "Best Western College" and "America's Best Value College" by Princeton Review. Back on the mainland is the state of South Carolina, home to the historic coastal city of Charleston and the alluring beach, golfing and dining destination of Hilton Head Island. Welcoming millions of travelers from around the world, Charleston and Hilton Head Island are the perfect places to learn about tourism. 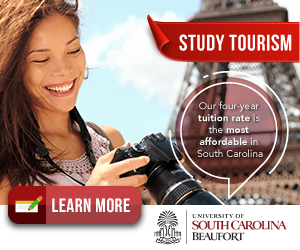 At the University of South Carolina - Beaufort, students will get the opportunity to intern at one of these thriving tourist destinations, and gain hands-on experience at the many hotels, attractions and restaurants nearby. The USC-Beaufort Hospitality Management degree will also equip students with the tools they need - everything from event planning to hospitality training - so they are ready to apply the skills they’ve learned in the classroom. The combination of education and work experience give graduates a unique advantage when entering the workforce, all the while taking advantage of the unique location of South Carolina. Florida is another key state to study tourism as it attracts visitors from around the world. One major city is Miami which attracts visitors to its nightlife, shopping, and beaches. There are many internship opportunities available to students who want to experience tourism firsthand. Johnson and Wales University's	North Miami Campus offers an undergraduate degree program in Travel-Tourism and Hospitality Management. This degree program involves semester-long rotational internships at various locations. Students will have the opportunity to work with international tour companies, cruise line operators, tourism offices, and much more. By participating in a rotational-internship such as this, an international student can gain a wide range of work-experience in different facets of the tourism industry. If you are attracted to theme parks, Orlando might just be the city for you! The city is home to attractions such as Sea World, MGM Universal Studios, and Walt Disney World which draws millions of people from around the world every year. Nearby is the University of Central Florida, which was ranked 19th in the world out of the top 100 hospitality and tourism programs by the Journal of Hospitality and Tourism Research. This school offers a diverse range of classes involving tourism such as travel and tourism economics, tourism information technology, managerial accounting, etc. With about 51.5 million visitors every year Orlando is by far one of the most famous tourist destinations in Florida and a great place to observe the tourism industry. Whether you want to be in Miami or Orlando, there are many schools that can give you access to top travel destinations right around the corner. Another great location to study tourism is at New York University (NYU)	which is located in New York City. NYU is situated in the heart of the city which has over 40 million visits from both international and American tourists every year. With so many international tourists visiting the city, it is regarded as the center of global tourism and hospitality. NYU offers a Bachelor's degree in hotel and tourism management which enables students to pursue a variety of different jobs. With this type of degree, as well as other types of tourism degrees, students can have careers involving hotels, resorts, tourism bureaus, conference centers, airlines, marketing and tourism agencies, meeting and special event management, restaurants, catering businesses, franchise operations, private clubs, resorts, and casinos. Although there are many factors to consider when choosing where to study tourism, the United States is home to some great tourism destinations and quality universities and colleges. Whether you're interested in studying in a big exciting city, near a huge theme park, or in a vibrant beach community, the US has it all. Miami, Orlando, and New York City are just a few of the U.S.'s cities with both popular tourist destinations and great universities, do a little searching and see which location is best for you!